Hero is one who possesses extraordinary skills and does acts which normal persons can only dream of doing ! In what would appear a straight lift from a movie – patrol cars chased a drugs suspect in a Ford Mondeo and the car stopped at a place where it could have caused havoc !! - Read a news of the heroism of Kathyrn Chapman… on searching something on Hull which lead to a place with great links to Cricket. She is 51 and mother of two – but one has to admire her presence of mind and the rich experience that she has added over the years……………. “Hull” is the watertight body of a ship or boat – the primary superstructure and / or deckhouse of a floating vessel. In Insurance Industry parlance, a Hull policy covers all vessels including inland vessels, country crafts, sailing boats, pleasure crafts, steam ships, tankers, containerships and more. In Aviation, hull is the aeroplane that is covered as the subject matter of insurance. River Hull is a navigable river in the East Riding of Yorkshire in the north of England. It rises from a series of springs to the west of Driffield, and enters the Humber estuary at Kingston upon Hull. The Port of Hull is a trading port located at the confluence of the River Hull and the Humber Estuary in the city of Kingston upon Hull in the East Riding of Yorkshire. Kingston upon Hull usually referred to as Hull, is a city and unitary authority area in the ceremonial county of the East Riding of Yorkshire, England. The mainline story is that of a Hero Police helicopter pilot who averted disaster by hovering in front of a speeding train to stop it ploughing into a car abandoned on the track. Police on patrol had chased a Ford Mondeo and the driver abandoned the car and ran away. It was on a railway line and a passenger service was steaming in – it would have been a disaster, if the engine could notice the vehicle on its track when closer to it. Kathryn Chapman, 51, flew backwards just 60ft above the ground and flashed her landing lights to alert the train driver to the obstacle ahead. He slowed the 60mph passenger service and came to a halt just 30 yards from where frantic cops were just heaving the car off the rails. 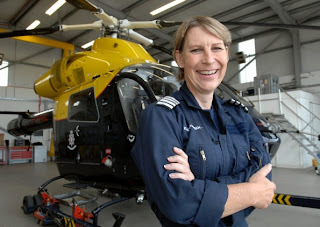 This woman flying Police helicopter (now a Police Captain) was a Ex-Navy Pilot who saw action the first Gulf War and Bosnia. On seeing the train approaching from atop, she went down positioned the copter in front, low enough to be sighted by the train driver and prevented a potential tragedy. Getting determined to get ahead of the train to be able to get closer she reportedly pulled speeds of about 120 knots, 145mph or 150mph. Her earlier experience in driving trains came handy – the train stopped safely – nobody was injured and car was recovered by the Policy. The driver of the car was also arrested for failing to stop and suspected drugs offences.